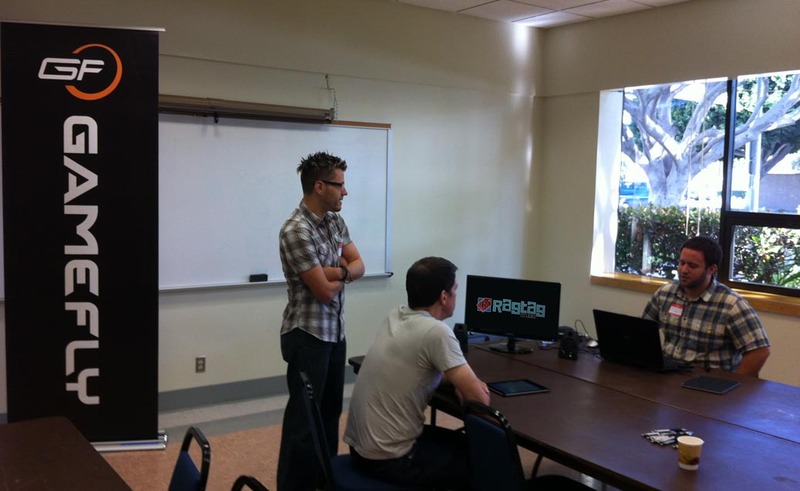 In early October, all members of Ragtag attended IndieCade in Culver City, CA. 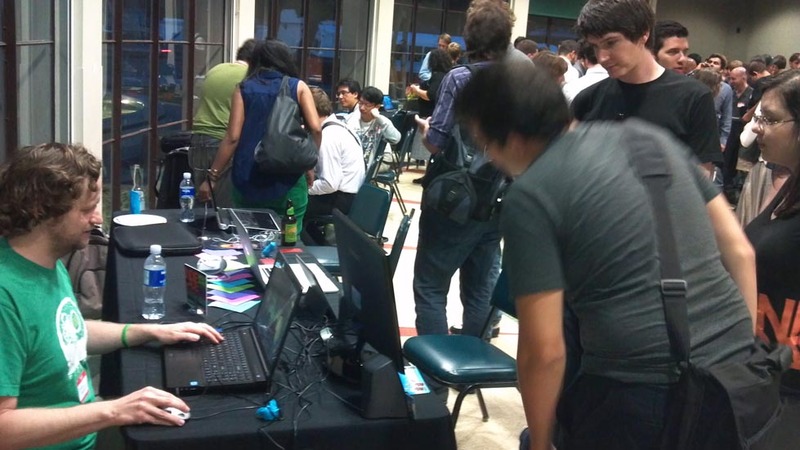 This Blog post will focus on our experience with the IndieXchange, a day long event that takes place the day before IndieCade begins. IndieXchange is an event that allows developers to interact with other devs, along with members of the press, publishers, and investors. Prior to the event, I had a hard time finding many details on exactly how the IndieXchange was structured. So in this week’s post, I’ll attempt to fill that void by talking about our experience. First off, we decided to go to IndieCade quite a while ago, for a few reasons. First, we have quickly learned the value of spreading our wings and meeting other like minded developers. There were sure to be a plethora at this event. Second, the timing of the convention served as a great checkpoint for the development of our new project. We decided early that we would use IndieCade as our first milestone. This worked out quite well for us, and as a result have decided to continue to use various conferences as timetables for reaching certain points in our projects. In big game development, the various conferences always had to be catered to anyway, but it was never planned for. So we’ve decided to, within reason, make them the driving force of our development cycle, effectively killing two birds with one stone. In early July, we began what would be a rather hectic 3 month charge that would yield our proof of concept for our new game. There were many ups and downs, but by the time October 3rd rolled around, we had something we were very proud to show. Regardless of the fact the new project is very early, we decided that we wanted to begin to show the game to press and publishers. PR is not something we’ve done a lot of, so we wanted to get the ball rolling early. As part of the three month prototype development, I did what I could to set up appointments with members of the press and publishers that I thought would be interested in taking a look at our game. From the people that were actually attending the show, the response in advance was great and we were excited for the appointments we made. Also during this three month period, I researched what opportunities IndieCade itself offered for showing your game around. The best candidate seemed like the IndieXchange. IndieXchange is something thats only available to developers that submit a game to the festival, but to be honest I’m not entirely sure why that is. Regardless, we entered Unstoppable Fist in advance, largely so we would be granted access to IndieXchange. This was the second year that IndieXchange had been offered, and I was able to find very little information on it in advance of the days before the event. The word was there would be a variety of presentations relevant to small developers, along with the opportunity to network with other devs. Most interesting to us, they would pair you up with press, publishers, and investors that had similar interests. On paper, this sounded great, exactly what we were hoping for. There were a few issues though. I was concerned that the matchmaking process would be purely based on the game we entered into the IndieCade competition. For us, this was a problem because Unstoppable Fist is an iOS game, and our new game will begin its life as a PC game. The second problem, is that not only were we unable to see what press, publishers, and investors were attending IndieXchange, but we were never given the opportunity to indicate who we were interested in speaking with. To be fair, we were able to fill out a survey in advance to express our expectations, but whether or not this information was actually taken into account is something I will never know. 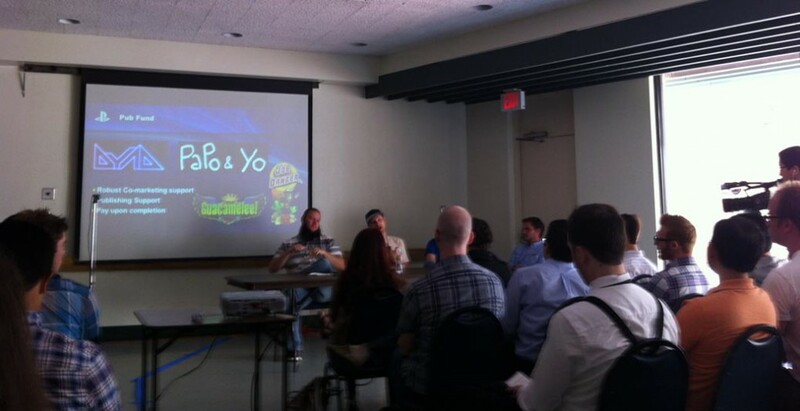 In the end, it turned out that there were three publishers meeting up with developers at the event. Those were Gamefly, Sony, and Activision. A couple of days prior to the event, we were contacted by a gentleman representing Gamefly, offering available meeting times. Gamefly has an initiative to publish promising looking iOS games. While we do plan to eventually publish our game on the larger tablets, it is not our initial focus. Regardless, our primary motive for this conference was to talk to anyone and everyone, so this would prove to be our first, and only meeting planned in advance at the IndieXchange. The Gamefly meeting time I chose was the first available time-slot. This got a groan or two from my cohorts, but I had good reasons for doing so. First, there were many other events planned during the day, and any other meeting time would have conflicted with at least one of those events. Second, and most importantly, I wanted to quickly break the ice by getting our very first meeting over and done with. For me, the anticipation leading up to something like this is far worse than actually doing it. So presenting early in the day would lighten us up for everything else that was to come. We arrived on time and immediately sought out the location of the Gamefly meeting room. We had a relatively elaborate set up, and I wanted to make sure we had time to properly get situated. It may not look terribly elaborate in the photo below, but you wouldn’t believe how many complements we received for having an actual monitor! I believe strongly in creating a comfortable environment to demo your game, and having someone sit on your lap while you demo your game on your laptop is the opposite of comfortable, in my opinion. Anyway, we got all set up, and in walks someone I’m a big fan of, Mr. Garnett Lee, to speak with us on behalf of Gamefly. Our first meeting went off without a hitch. Garnett was great to talk with, and our nerves were calmed for the rest of the show. I won’t get into the details of the meeting, but we felt we were off to a good start. In order to keep this concise, I’ll give a general synopsis of what most of the day held. It was a very slow paced day. One issue we had with the IndieXchange setup is that if you weren’t interested in the presentation that was taking place, there wasn’t a whole lot else to do. Or, in our case, if you had three people as part of your group, and it was plenty for one person to check out each presentation, the others mostly lingered around. Even so, at least one of us attended all of the various presentations, and some good knowledge was dropped. We did make the most of our downtime though, and whenever we could we would chat up some of the other devs. We were pleasantly surprised how open everyone was to conversation with strangers. There was no pretense whatsoever, and I can honestly say everyone we met this day is someone I would like to see again and have a beer with. Really great, talented people. Part way through the day we turned our focus to the Game Tasting. Not really sure what to expect, we went ahead and signed up for it. I’m not sure what the need for signing up was, as it turned out it was just a chunk of time where everyone gathered in the main room for beers, and everyone wandered around and checked out each others games. Shawn demoing like a champ. The game tasting was another great opportunity for us to practice demoing our new game to a variety of people with a variety of interests. Especially at this early stage in the games development, its always interesting to hear the things that occur to people. Perhaps the most encouraging words we heard were people commenting on how they weren’t happy with certain aspects of the game. For example, one gentleman commented that he didn’t feel the AI were as responsive as they should be. The reason I take this as a huge compliment, because this is a game thats only in development for 3 months! The fact that people were taking a look at it and getting the impression that its close to being done is a huge compliment. The reality is that we have about a year of development left… and there isn’t any “real” AI in the game at all yet! 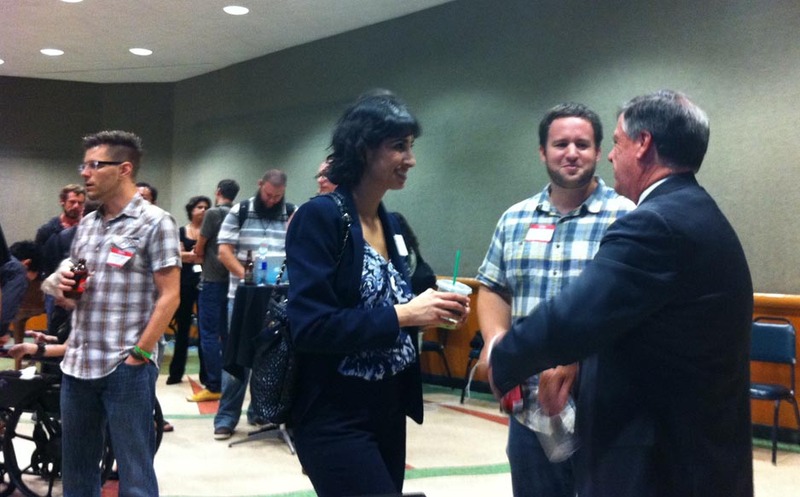 I talk with the Vice-Mayor of Culver City about our game. In summary, IndieXchange did a lot of great things for us. I see it as a great icebreaker for what was to come over the next three days at IndieCade. We met with a lot of devs, who we would continue to meet up with over the next few days, and ironed out any issues we had with our presentation. That said, there are a lot of things that could be better about IndieXchange. There was a substantial amount of down time. The organization left a lot to be desired, and the promise of matching everyone up with press, devs, and investors was certainly not what I’d hoped it would be. Even so, the event is only in its second year, and their heart is in the right place. I’m sure they’ll get the kinks worked out. I was hoping there would have been some sort of follow up where they ask for opinions, but I’ve yet to receive anything. Wow, this ended up much longer than I intended, and I didn’t even talk about the Indiecade portion of the conference as I intended to. I’ll have to save that for a later blog post. If anyone has any questions about the IndieXchange, please post them in the comments, I’ll be happy to answer. Thanks for posting this Chris! It’s great to get a look into this event. Really glad the reception of your game was so positive and I look forward to it’s development. For your first time in these waters, you’ve done an amazing job approaching every hurdle with deft strategies together with your team’s preparedness. It’s so amazing to see game dev pros like yourself working in the indie space. So excited for what’s next. Thanks Eric! One of the exciting, but scary aspects of starting our own indie studio is taking on new challenges that we haven’t had much experience with. PR is one of those!